Need to move your car easily without the motor running? Car dollies are your friends. Our buying guide will tell you everything you need to know to pick the perfect car dolly. Why do I need car dollies? That’s a great question, the reason why is if you have trouble moving your vehicle a short distance after a mechanical or engine failure then car dollies or tire skates are just what you need. These wheeled platforms fit under each tire, so you can move it into the garage or mechanic’s workshop. It makes more sense to move the car itself, instead of going around it and these devices will allow you to rotate the vehicle and put it away until you work on it again. So, they are perfect for restoring a classic car or storing a show vehicle away for the winter. They can also be used to move automobiles 360 degrees or forwards and backwards, so they can be pushed around a small space like your garage. The car dollies need to be tough and durable, as they have to carry a heavy load, so make sure that you opt for a product that can withstand your car’s weight and is the right size for the vehicle. There are many different models on the market, in several designs, some suited to large cars and some to stationary vehicles. So, in order to help you choose the best car dollies for your needs, then refer to our extensive buying guide below. All the products can be purchased from www.amazon.com. There are two main types of car dollies, standard and hydraulic. Standard, otherwise known as wheel plate is a solid piece of metal, which is raised up with wheels underneath. They may also feature brakes and wheels on castors. Hydraulic car dollies are more complicated. They incorporate a pair of rollers, which are connected to a tough, foot-operated hydraulic unit. Therefore, you can elevate the vehicle, without using other equipment, so they are very convenient for day to day use. But, in keeping with their increased technicality, the price tag also goes up exponentially. 1. Weight capacity: This is very important. Most car dollies lift three tonnes, so they will fit most smaller and larger sedans, hatchbacks, SUVs and also some lightweight mini trucks and vans. Two tonne products are less common but they are cheaper and will suit a two tonne car. But to get maximum load-bearing capacity, it is better to go for the heavier weight limit. 2. Number of dollies: Obviously, you will need four tire skates for your vehicle but this could prove to be expensive, so you can get away with only buying two. This will be adequate for your needs, as you would need to fit a pair to the front or back wheels to maneuver the car around enough for most tasks. 3. Tire dimensions: The car dollies have to fit your automobile’s tires. The dimensions (width, aspect ratio and radius) will be written or stamped on the side-line of the tires. It is advisable to purchase dollies a few inches more than your require, so you have wriggle room. The tire width is paramount. Some companies make adjustable dollies which can be tightened or loosened, depending on your car’s width but these are more expensive. 4. Durability: You need to choose car dollies made from strong materials, such as steel or aluminium and the screws should be firm and tight. If they come loose, then the tire skates are no good. 5. Brakes: If you select a model with built-in brakes, then it will be easier to hold the car in one position when you are working on it. 6. Ball bearing castors: Castors are used to attach the dolly to its wheels and the best models feature ball bearing mounted castors which rotate and enable you to push the vehicle in multiple directions. As an optional extra, you could also consider adjustable height car dollies, like the ones OTC Tools offer. These are a premium product and they are fully customizable. They are similar to car jacks as they include screws to lift up the vehicle or clamp the device onto the wheel. However, the best models can cost up to $400. So, if you are on a budget, they may be a luxury that you can ill afford. But if you can stump up the cost, then they are definitely worth having to improve your vehicle maneuvers. The main point to bear in mind is that the car dollies need to be able to withstand your vehicle’s weight without sagging or buckling. You need to choose devices which are tough and resilient as too much pressure may cause the metal plates to snap. Those made from copper or tungsten alloys are the strongest. 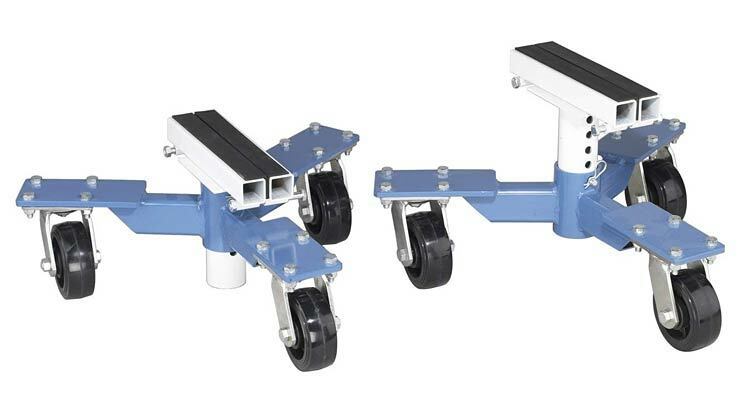 These heavy-duty vehicle dollies with radial ball bearing axles come in a set of four. 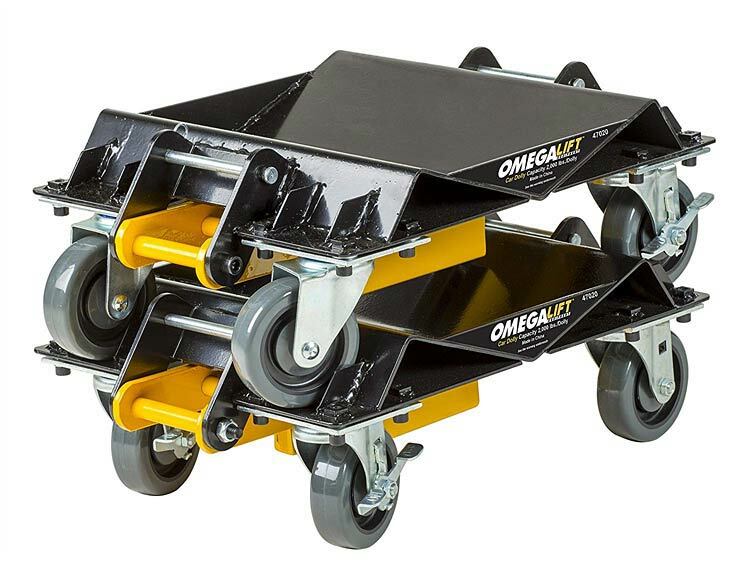 They make the vehicle easy to push by yourself on both rough and smooth surfaces, as each wheel features two dual bearing swivel castors, allowing for multi-directional movement when loaded. They have two brakes, which will hold each dolly in place. Each Red Hound tire skate is made of steel with a diamond plate and finished with a black powder coating, making them long lasting. The devices include a convenient carrying handle, so you can easily pick them up or hang them. They also come with a storage rack, to pack them away when not needed. Their tough construction allows them to bear the weight of most vehicles. 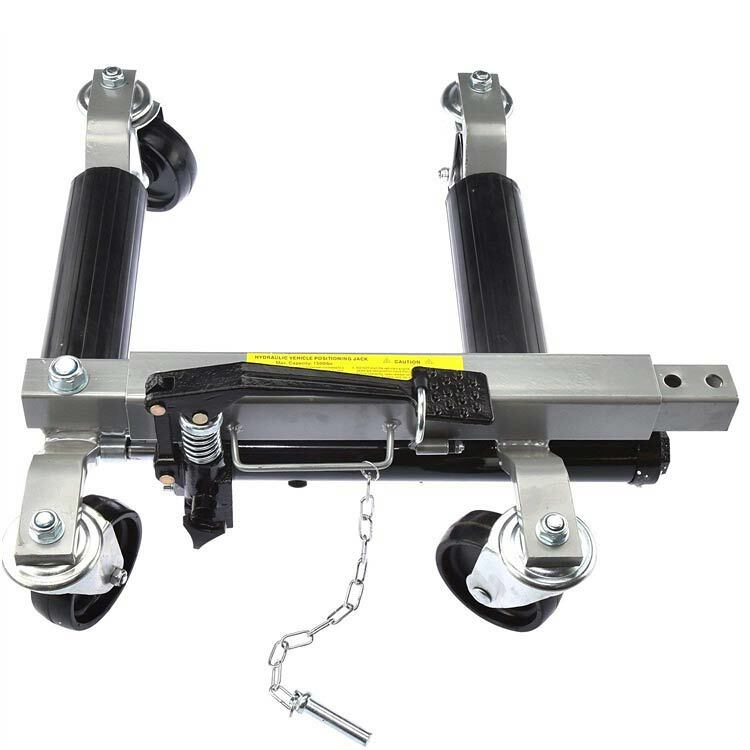 These high end car dollies are suitable for use in garages, repair shops and showrooms and will allow you to smoothly roll cars, trucks, trailers, boats, tractors, ATVs, motorcycles, aeroplanes, furniture and other equipment. When compared to using a single bearing dolly, you will encounter a lot less resistance, as these are premium bearing axles. Red Hound was formed by a group of experts with many years of experience in the American automotive industry, so you know that you’re purchasing a quality product. These are much simpler car dollies in design, as they do not incorporate a carry handle or brakes but can still be operated by one person. The steel wheels and castors are also smaller than on some other models, so it will be harder to push a heavy vehicle but they maintain balance. Despite not featuring any fancy extras, they are sturdy and reliable and do the job. Their eye-catching color increases visibility in the dark, if you have broken down and the wheel profile will keep debris off the road, so you don’t come to a halt. 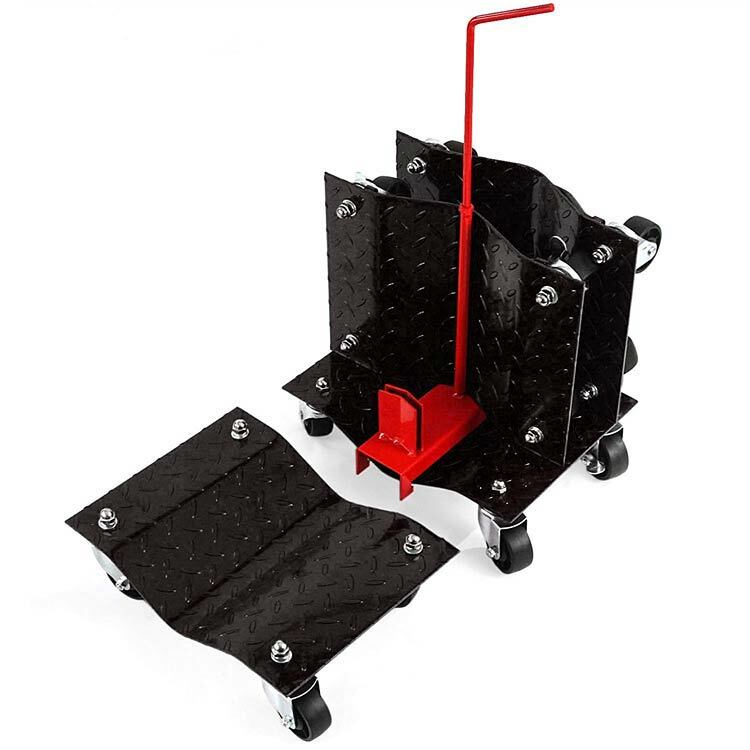 The Merrick dollies are suitable for use with large three tonne cars, mini trucks, vans, trailers, boats, motorcycles, snowmobiles, jet skis and lawnmowers. They are adept at raising vehicles for maintenance work or for cleaning the garage floor, rather than moving them around. However, they can sag and depress when carrying a heavy load. These set of four commercial grade car dollies are a deluxe product. They are made from industrial grade steel with a powder coating, making them extra tough and resilient. Even under heavy pressure, they will not break and will keep their shape after long term use. The plated steel wheels will make it easy to move your vehicle after it has been mounted and the robust three-inch ball bearings will lead to smooth maneuvers and less wear and tear. They provide 360 rotation and free rolling. Pentagon Tools Tire Skates suit medium to heavy vehicles and they are ideal for restoration projects. They will give you exceptional support, so even a person of average build can move a three tonne car. When you have finished using them, just take advantage of the integrated storage hole, so you can hang them from a hook in your workshop. These car dollies feature a patented castor design with less than half the force of other available castors, so they are versatile enough to be utilized by professional mechanics. They do require assembly as the ball bearing wheels need to be fixed to the dollies but this is not difficult. These extra large skates are a lot wider than regular models. They are very hardwearing and will not scratch or chip, as long as you keep them lubricated. These car dollies come in a pack of two, hence the lower price but they are cheap enough to buy two sets! They are made from sheets of metal with a raised diamond pattern to provide extra grip. 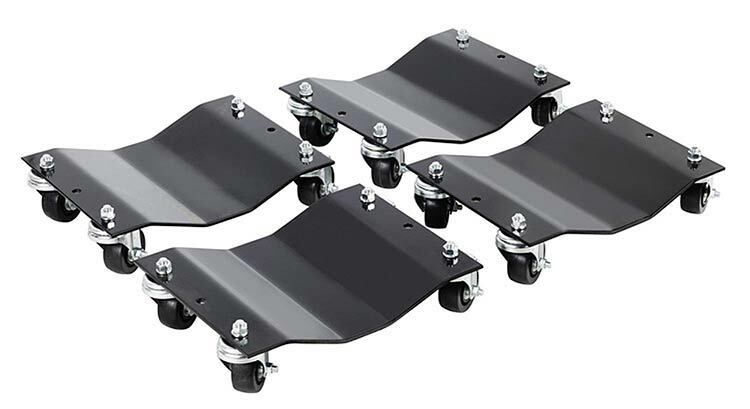 These tire plates then rest on four 2.5 inch swivelling ball bearing castors, making them easy to maneuver in all directions. Each dolly has a dip in the middle to cushion the wheel, so they can lift the car 2.5 inches off the ground. The WEN vehicle dollies also feature a handy carry handle and built-in brakes for increased stability. Their black paintwork will not make them stand out in a poorly lit garage, or on a dark roadside, though. But the two year warranty will ensure customer satisfaction. This two piece car dolly set has a premium price tag but packs in a lot of complex features. It is very versatile and can hold your vehicle in one of three ways. 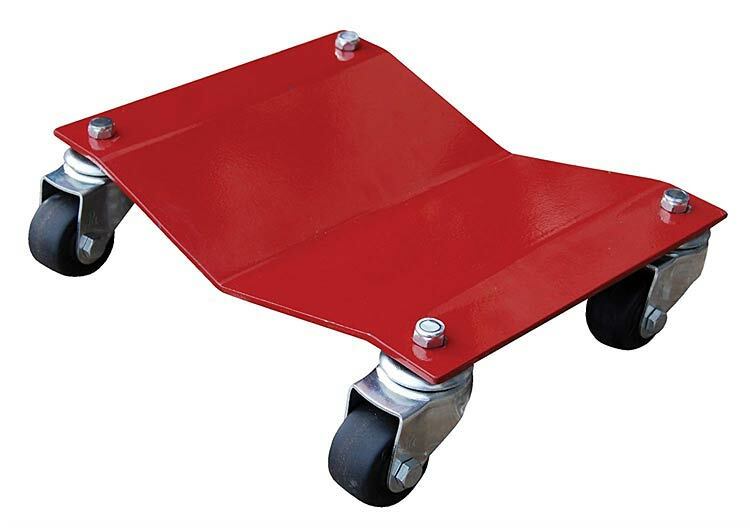 Firstly, you can use it as a regular wheel dolly, secondly, you can support the car by the pinch weld, or alternatively, you can hold it by the vehicle frame itself. Ingenious or what?! And because of their increased weight capacity, this is the strongest set of car dollies on our list. They are easy to operate too, as their huge wheels make rolling a piece of cake. You can also quickly assemble them without using tools, as they include integrated frame adapters. 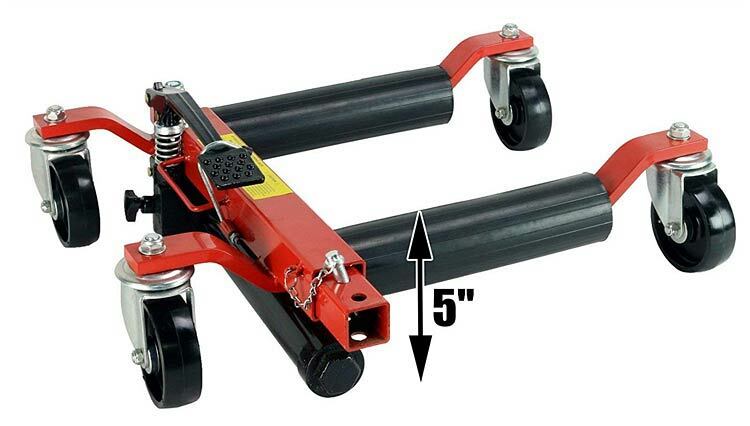 The wheel castors and adapters are can be locked, making the dollies extra secure when you are moving a heavy load. Even more conveniently, they are designed to neatly stack on top of each other, thereby freeing up much needed storage space in your garage. This two piece car dollies set is designed to be universal, so you can use them on any vehicle, without the need for additional adapters. Their ground-breaking design includes patent-pending technology that clamps directly onto the vehicle’s tires. This reduces the risk of slippage when in use and provides dependable support. Another innovative feature is that each dolly has its own lift saddle, allowing it to hold the car in the air like a jack. They can be adjusted to a low as 9 inches or as high as 14 inches and these variable heights give you more versatility and maximum adaptability when working on the car. Because you are using two independent pieces, you will never have to adjust the width or match the tire placement, whatever type of vehicle you are fixing. Each lift saddle has a rubber pad on top, to reduce friction and they will not damage the vehicle’s frame. They feature polypropylene castors allowing for easy movement of a front wheel drive vehicle, after you have removed the drivetrain. These high-performance multi-purpose tools differ from other car dollies, as they will allow you to move a vehicle with or without tires. They are the best product for light and medium cars, such as small SUVs. So, don’t be put off by their cost as OTC tools have a wide range of uses. Now, let’s move onto the hydraulic options. This high quality all steel car dolly set is available in both two piece and four-piece options. It is highly customizable and comes with a one-year warranty. Fitting the devices is easy: you just loosen the hydraulic screw, then pull apart both ends of the dolly to fit it around the tire and secure it. Then, you use the quick release foot pump to carefully raise the automobile up. Once it has been lifted, you fasten the safety lock pin, which will keep your car secure as you transport it. 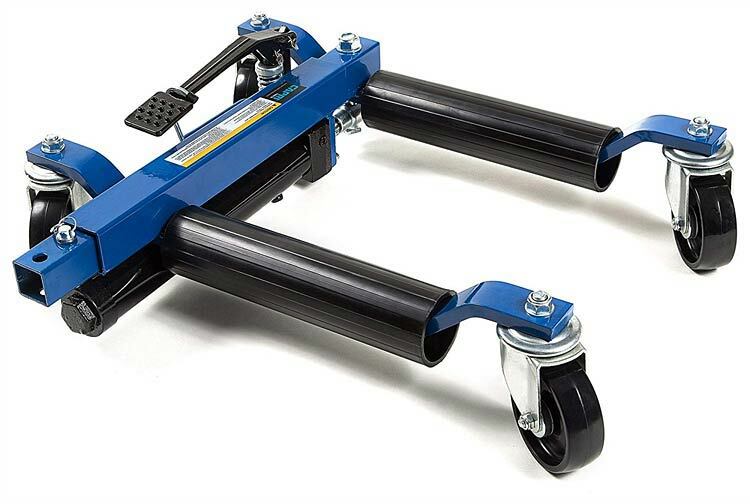 These dollies can clamp onto tires up to 12 inches wide and they feature castors with a diameter of 4 inches, which swivel to aid maneuvrability. The included stand will allow you to store the dollies away when not in use. And now for a deluxe car dollies set. It features a patented design that allows you to easily move even a large vehicle by yourself, whether you are pivoting the car on two dollies or using four for maximum maneuvrability. They are simple to operate: you just need to slide the skates under or around the tires, then step on the included foot jack, which squeezes the two sides of the dolly together and gives a total of 6.5 inches of ground clearance. The skates are fully adjustable and will fit tires from 12 to 22 inches wide. 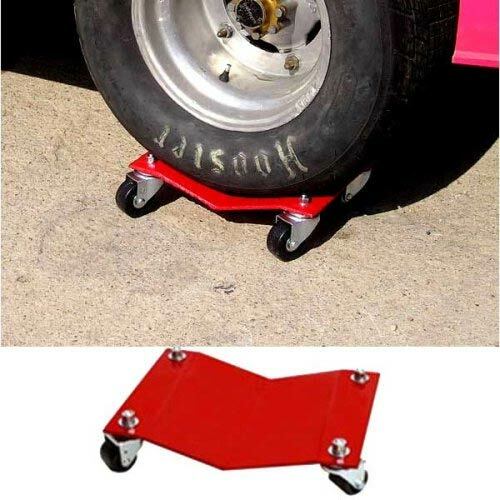 Dragway Tools car dollies have a resilient red powder coated finish, making them scratch and stain resistant and the frame is made from heavy duty ½ inch steel to ensure durability. Their four-inch swivel castors make them ideal for moving almost anything. The hydraulic mechanism may lose pressure over time but as long as you use these devices as specified, this should not be a problem, especially as you receive a one year manufacturer’s warranty. This four-piece car dollies set is expensive but they are built from solid steel and will last for years, so they are worth the extra investment. The fracture proof frame and solid rubber castors will withstand wear and tear. Their dolly deck design will cradle the car’s tires and the swivel castors make moving around easy. The painted finish looks stylish and they will not scratch your garage floor. They are heavy but sturdy and easy to use. Now, last but not least! Don’t be put off by the uninviting name, these lightweight dollies pack a lot of punch for a low price. They feature a simple design and they are perfect for small cars. The nylon or steel wheels are attached to ball bearing castors, so you can easily maneuver your vehicle in all directions. The Generic car wheel dollies are constructed from tough metal and finished with durable black powder coating. They can handle tires up to 14 inches wide and are ideal for moving cars into storage. When your engine breaks down, the last thing you want to do is maneuver your car yourself. This is time-consuming and dangerous, as you may injure yourself in the process. Car dollies will take the strain and take the weight off you, leaving you to relax. In effect, they are skateboards for your car tires. They are preferable to jack stands, as they raise the car and make it easier to move. Jack stands are designed to elevate the automobile in order for you to work underneath it. Car dollies are more suitable for long term storage, when you want to put your prize and joy away during bad weather. You just put the car on a set of wheel dollies and tuck it away in the far corner of your garage, freeing up space for other equipment. The vehicle will be elevated and will rest its weight on the tire skates. Just make sure that you monitor the tire pressure periodically and re-inflate when necessary. So, now we have outlined the best car dollies for 2018, there is nothing stopping you from completing basic vehicle maintenance from the comfort of your own garage!